In addition to the super dove and duck hunting, Gabino's Outdoor Adventures offers exciting walk-up quail hunting for two unique species: Gambel's quail and Elegant quail. 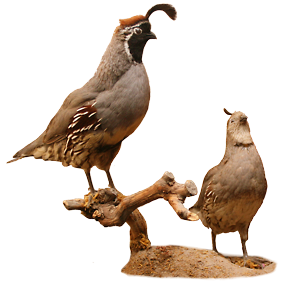 The Gambel's quail is a southwestern/desert species with marvelous coloring and the guile and running ability of a cheetah. It prefers the grassy, flat country and cropland, and gathers in huge coveys of 20 to 50 birds. Conversely the Elegant Quail, with its subtle coloring and white spots, holds well like a bobwhite. Found mainly in the highest desert elevations, they are challenging and exciting to hunt. Hunting for either or both types of quail is a fun option on a trip to the Yaqui Valley.